The continuing stooo-ry of "A My-Life Christmas" continues with this installment, published in the Revere High School Lantern on November 17, 1993. In May 1994, this comic strip was re-published in a special Lantern compilation since the storyline won the Lantern's Best Comic of the 1993-1994 Year Award (as if that's news to you by now). Not too much going on in this one. Some of the heads on the characters look a little weird (most notably Officer Karrots's in the last panel). 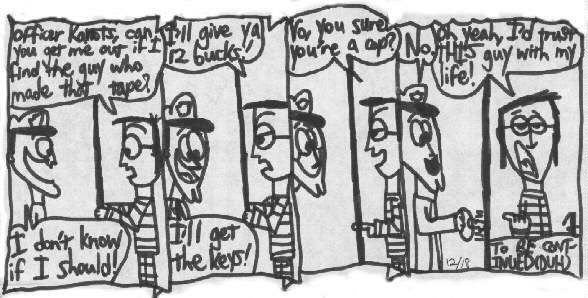 Notice Greg says "Yo" (cringe) in the third panel, more evidence that I still didn't have a firm grasp on Comic Greg's character just yet. In my sketchbook, I had drawn an idea for a following "chapter" that I ended up not using, in which Greg makes a quick escape from a cop that's chasing him after our hero gets out of jail. Sequences like that would have worked well (I think) in animation, maybe like in a My-Life Xmas special that can be shown every year on CBS or something (ya listening, Warner Bros.??? ).